(Nanowerk Spotlight) We are experiencing an unprecedented resurgence of interest in herbal healing, and 'herbal renaissance' is happening all over the globe. The Western world has begun to acknowledge the importance of traditional medicines as they symbolize safety in contrast to the allopathic medicines, which tend to produce undesirable side effects and are lacking in curative value. In the realm of medicine, nanotechnology holds enormous promise for benefit of the society by potentially reducing the miseries of people suffering from grave illnesses and save a great number of lives. 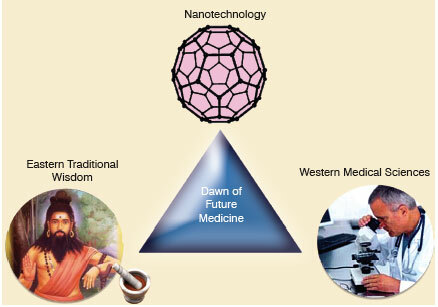 Traditional Oriental medicine would greatly benefit by integrating with the scientific advancements in medical science and diagnostics in concert with nanotechnology. This trinity may usher in a new era of affordable, safe and effective medicinal system. Turmeric (Curcuma longa L.) is the shining star among the cornucopia of traditional medicinal plants. It has a long history of usage in traditional medicine in India and China. Ancient Indians have known the medicinal properties of turmeric, thus curcumin, for several millennia. The cultivation of turmeric plants began in Harappan civilization in 3000 BC1) and Susruta Samhita, dating back to 250 BC, highly recommends use of an ointment based on turmeric for relieving food poisoning effect2). Turmeric was introduced to China from India by 700 A.D.3) and has been said to be long used as a medicinal herb. It has been used in Ayurvedic medicines internally as a stomach tonic and blood purifier, and topically in the prevention and treatment of skin diseases. Recently, turmeric came into the global limelight when the controversial patent "Use of Turmeric in Wound Healing" was awarded4), in 1995, to the University of Mississippi Medical Center, USA. Indian Council of Scientific and Industrial Research (CSIR) aggressively contested this award of the patent. It was argued by them that turmeric has been an integral part of the traditional Indian medicinal system over several centuries, and therefore, is deemed to be 'prior art', hence is in the public domain. Subsequently, after protracted technical/legal battle USPTO decreed that turmeric is an Indian discovery and revoked the patent. The significance of turmeric in medicine has changed considerably since the very recent discovery of the anti-oxidant properties of naturally occurring phenolic compounds. The same ground dried rhizome of Curcuma longa, which has been used for centuries as a spice, food preservative and a coloring agent, has been found to be a rich source of phenolic compounds. The bio-active polyphenol component of turmeric is curcumin, also known as diferuloylmethane (C21H20O6), with an ability to prevent and cure diseases. Turmeric contains about 2-5% curcumin alone. Commercial curcumin contains three main types of curcuminoids, i.e., curcumin (diferuloylmethane or"Curcumin I" about 77%), demethoxy curcumin ("Curcumin II" ∼17%) and bis demethoxy curcumin ("Curcumin III" ∼3%)5). Curcumin (diferuloylmethane renders its bright yellow color to turmeric. In addition to natural curcumin, several analogues of curcumin have been synthesized and studied7). These include tetrahydrocurcumin (antioxidative), 4-hydroxy-3-methoxybenzoic acid methyl ester (HMBME), aromatic enone and dienone analogues, metal chelates of synthetic curcuminoids etc. In the scientific literature there is a large body of evidence (8-14) showing that curcuminoids exhibit a broad spectrum of biological and pharmacological activities including anti-oxidant, anti-inflammatory, anti-bacterial, anti-fungal, anti-parasitic, anti-mutagen, anti-cancer and detox properties. Curcumin's unique ability to work through so many different pathways with its extraordinary antioxidant and anti-inflammatory attributes can have a positive influence in combating almost every known disease. Extensive studies carried out by researchers around the globe have clearly demonstrated curcumin's great potential as a thercurcuminapeutic agent, and have paved the way towards conducting clinical trials for a variety of diseases including cancer, cardiovascular, neurological and gastrointestinal disorders, multiple sclerosis, diabetes type II, skin diseases, cystic fibrosis, cataract etc. Cancer, probably the most dreaded disease afflicting humans ever since time immemorial, but most of us know little about it other than the fact that it originates from uncontrolled growth of a single cell. Siddhartha Mukherjee, in his Pulitzer Prize winning monumental piece of work15) "The Emperor of all maladies: A biography of cancer", meticulously outlines the trajectory of cancer. He describes cancer as being "unleashed by mutations-changes in DNA that specifically affect genes that incite unlimited cell growth." Their unrestrained growth if unchecked and untreated eventually kills the patient. In order to win the battle against this dreadful scourge, we shall require new tools and out-of-the-box approaches. Nano-enabled traditional medicines based on herbs (e,g,. curcumin, coptis chinensis (Huang Lian), coriolis versicolor, ashwagandha, resveratrol, pomegranate, green tea etc.) integrated with the clinical and evidence-based approach of modern medical science may provide a long lasting solution to this age-old problem. Curcumin offers significant potential as a cancer chemopreventive agent. There is a wealth of evidence in the literature suggesting that the incidence and mortality rates of common types of cancer such as breast, colon, prostate and lung are considerably lower in India than those in western nations such as the USA16). The lower incidence of cancer in India has been attributed to high consumption of curcumin (in the form of turmeric) by the Indian population. Of course, other ingredients of their diet such as garlic, ginger, onion, tomatoes, cruciferous vegetables, chillies, green tea etc. also might be playing an important role in their ability to resist the onslaught of these cancers. In addition to the remarkable ability of curcumin to prevent cancer, it also shows the potential to inhibit the growth of cancer throughout the body by metastasis (i.e. the process by which cancer cells spread to other parts of the body via lymph or blood). Curcumin has also been found to enhance cancer cells' sensitivity to some of the anti-cancer drugs making chemotherapy more effective in combating this deadly disease. Curcumin's cancer-fighting capabilities against breast cancer, lung cancer, brain tumours, leukemia, liver, intestine, esophagus, and bowel cancers, melanoma, gynecological cancers etc. have been demonstrated based on numerous well established scientific studies (17-24) and preclinical and clinical trials being carried out by researchers in the US, India, Japan, Israel, Australia, China and Holland. The various mechanisms involved in anti-cancer activities have been summarized and presented in a simplified form in the following paragraphs. The interested readers may like to look at more comprehensive publications (Ref: 17-24) for further details. Curcumin has the ability to work at a cellular level. At the embryonic stage itself, it regulates the cellular replication cycle and helps in blocking an uncontrolled multiplication of new tissue cells into tumours. Curcumin being a potent anti-oxidant is able to inhibit the activity of enzymes (e.g., cyclooxygenase-2 (COX-2)) responsible for cancer causing inflammation. Inflammation is one of the major causes for the development of cancer as it releases powerful free radicals which both induce cell division and mutation, thus the anti-inflammatory activity of curcumin plays a key role in the treatment of cancer. Curcumin induces apoptosis (genetically directed programmed cell death) in unhealthy, abnormal and rapidly reproducing cancerous cells, without affecting healthy cells. Curcumin has the unique ability to identify the cancerous cells by their abnormal chemistry and to transmit "self-destruct" signals, thereby inducing apoptosis of the diseased cells. Curcumin strengthens the immune system and can help the body to fight off cancer should certain cells escape apoptosis. Ingestion of curcumin boosts the killing power of immune system cells, such as T cells, NK cells, and macrophages. Strengthening of the immune system also helps in lessening the side effects that may be caused by some cancer treatments such as chemotherapy, radiation therapy or surgery. Angiogenesis is a process of growth of new capillary blood vessels, which plays a crucial role in promoting the growth of tumours and metastases. Curcumin inhibits blood cell formation, and thereby, restricts the blood supply to cancer cells resulting in their death due to starvation. Cancer patients suffer from various treatment-induced symptoms like neuropathic pain, severe depression, lack of sleep, fatigue, loss of appetite etc. Curcumin has the potential to act against a wide variety of these symptoms by suppressing the activation of NF-kB and NF-kB regulated TNF, IL-1 and IL-6 expression, and in turn, provide some relief from misery to the patients. Today curcumin has been widely acknowledged globally as a "wonder drug of the future" because of its great potential abilities to prevent and treat a wide spectrum of incurable and chronic diseases. In addition, it has been proved to be remarkably safe in animal studies and in phase I clinical trials even at high doses (up to 12g/day). However, the major problem limiting the exploitation of its potentially valuable therapeutic effects is its low bioavailability25). In practice, only very low or undetectable levels of curcumin can be achieved in blood by oral administration of curcumin. The low bioavailability of curcumin has been attributed to its very low aqueous solubility, tendency to degrade in the gastroinenstinal tract in the physiological environment, high rate of metabolism, and rapid systemic elimination. The low bioavailability of curcumin has so far limited its medical use. It has been suggested that a person is required to consume large doses (about 12-20g/day) of curcumin in order to achieve its therapeutic effects on the human body26). That means one has to swallow 24 to 40 curcumin capsules of 500mg each. These doses are considered to be too high, and therefore, not feasible to be incorporated in clinical trials due to unbearable after-taste to the palate, possibility of giving rise to nauseatic feeling and perceived toxicity issues. Therefore, to achieve the maximum response of this potentially useful chemopreventive agent, a number of approaches such as the use of adjuvants like piperine, synthetic analogues, chelating of curcumin with metals, combination with other dietary agents etc. have been investigated. Nanotechnology-based novel strategies are being aggressively explored worldwide to enhance curcumin's bioavailability and reduce perceived toxicity as they offer several other additional benefits such as improved cellular uptake, enhanced dissolution rates, excellent blood stability, controlled release functions, multifunctional design, enhancement in its pharmacological activities (e.g. antioxidant and antihepatoma activities) etc. A 2010 article on polymer nanoparticle-encapsulated curcumin27) has been ranked as one of the top ten most accessed articles (48029 accesses) for all time by the Journal of Nanobiotechnology. This clearly demonstrates the emerging importance of this field (nanotechnology-based drug delivery of curcumin based systems). In this pioneering work, researchers from Johns Hopkins University School of Medicine and the University of Delhi have jointly developed a polymer nanoparticle-encapsulated form of curcumin, "nanocurcumin", which can be readily dispersed in aqueous media. In this process, they have coated ordinary hydrophobic curcumin particles with hydrophilic polymer (N-isopropylacrylamide with N-vinyl-2-pyrrolidonne and poly(ethylene glycol) monoacryalate) nanoparticles. This nanocurcumin is soluble in water and can be readily absorbed into the bloodstream. It has already been tested in vitro on pancreatic cancer cells and it was shown to have equal or better effects than free curcumin on the human cancer cells, such as inhibition of NF-kB and downregulation of IL-6. Nanocurcumin was also given to mice, and did not show any evidence of undesirable effects. In addition to polymer-encapsulated curcumin, other nanobased drug delivery systems being employed for curcumin include curcumin nanocrystals, curcumin nanoparticles, nanoemulsions, nanoliposome-encapsulated curcumin, curcumin-loaded polymeric micelles, cyclodextrin/curcumin selfassembly, curcumin nanosuspension, solid-lipid nanoparticles etc. These systems along with their expected benefits are briefly presented in the table below. In view of the enormous potential of curcumin in the prevention and therapy of a wide spectrum of diseases, in recent years, intense R&D activities have been undertaken throughout the world in various establishments. 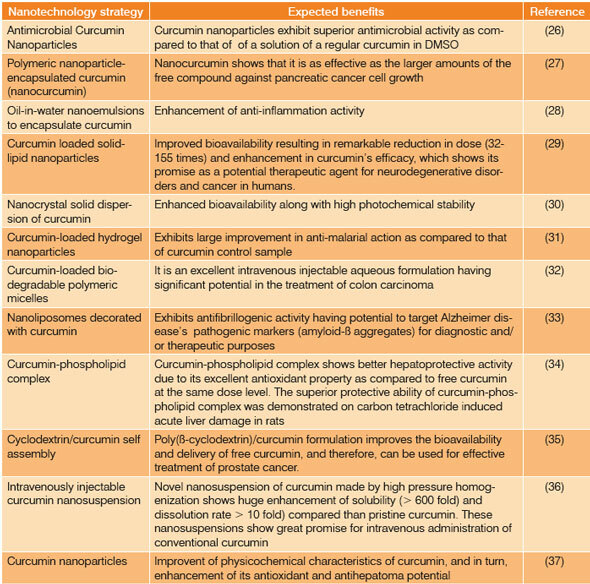 The selected examples below highlight some of the ongoing R&D activities on nanotechnology-based curcumin across the globe. Japanese researchers have recently developed a new form of nanoparticle curcumin (Theracurcumin) containing 10% curcumin, 2% other curcuminoids and balance glycerin, gum ghatti and water. Its oral intake in rat model as well as humans shows 30 fold improvement in bioavailability as compared to conventional curcumin. It shows excellent safety profile even at high dose levels. Theracurcumin can be used as a promising tool to evaluate the anti-cancer potential of curcumin in clinical trials. Curcumin-based nanoscale particle system (CURN) was developed by following a nanoprecipitation route with polyvinylpyrrolidone (PVP) as a hydrophilic carrier. The physiochemical properties including water solubility and drug release were improved by the reduction of particle size and formation of an amorphous phase with hydrogen bonding. In vitro studies clearly demonstrated that nanosized curcumin shows superior antioxidant and antihepatoma activities as compared to conventional curcumin. Water-soluble curcumin nanoparticles (2-40 nm) were prepared by wet milling method. These nanocurcumin showed marked improvement in their antibacterial and antifungal activities as compared to that of curcumin in DMSO. The antibacterial activity of nanocurcumin particles was attributed to their ability to penetrate inside the bacterial cell by breaking the cell wall, resulting to cell death. Chitosan-PVA-Silver nanocomposite antimicrobial films were fabricated by a chemical method in view of their potential applications in antimicrobial packaging and wound/burn dressing. Incorporation of curcumin into chitosan-PVA-silver nanocomposite films improve their therapeutic efficacy as anti-microbial agent. Curcumin-encapsulated chitosan-PVA-silver nanocomposite films show enormous growth inhibition of E-coli in comparison with curcumin or chitosan-PVA-silver nanoparticles film alone. Curcumin encapsulated into monomethoxy poly(ethylene glycol)-poly( -caprolactone) (MPEG-PCL) biodegradable micelles were prepared by a nano-precipitation technique. These curcumin-loaded micelles are an intravenously injectable formulation of curcumin. They were shown to supress the growth of colon carcinoma by inhibiting angiogenesis and killing the cancer cells. Polybutylcyanoacrylate nanoparticles (PBCN) loaded with curcumin were synthesized by modified anionic polymerization technique. Curcumin loaded PBCN shows enhanced transport of curcumin to the brain and has excellent potential to cross the blood-brain barrier. This novel delivery system will find applications for blocking brain tumor formation and curing Alzheimer's disease. A cationic liposome containing PEI and PEG as a carrier complex (LPPC) was developed to encapsulate curcumin for the treatment of cancer. It was found that curcumin/LPPC exhibits enhanced cytotoxicity and is able to rapidly penetrate curcumin-sensitive and resistant cells. It was observed that curcumin/LPPC is able to inhibit the colon/melanoma tumor growth in mice. Intracellular co-administration of Paclitaxel (mitotic inhibitor) and curcumin (NF-kB activity inhibitor) in the form of nanoemulsion exhibits remarkable enhancement in cytotoxicity in wild type (SKV3) and drug resistant (SKOV-3TR ) human ovarian adenocarcinoma cells by promoting apoptotic response. This dual strategy shows great promise in the clinical management of refractory diseases (diseases that resist treatment) such as ovarian cancer. Ovarian cancer cells are resistant both to radiation therapy and cisplatin-based drugs used in chemotherapy. Nano-enabled curcumin pretreatment strategy with enhanced efficacy and specificity was employed to induce chemo/radio sensitization in ovarian cancer cells. It was shown that this pretreatment with nano-curcumin improves in vivo therapeutic efficacy of curcumin, and thereby, inhibits the ovarian cancer cell growth. The coadministration of DOX and curcumin in PLGA nanoparticle formulation can help in enhancing efficacy of DOX, thereby leading to cytotoxicity in erythroleukamia type K562 cells. The synergistic growth inhibition is clinically important and may provide combinatorial strategies in a variety of cancers, especially leukemia. In addition to the above approaches, a number of other unique nanotech-based techniques including a class of novel multifunctional hybrid nanogels amenable to photothermal therapy48), "nanodiscs" with phospholipids bilayers49), biocompatible thermoresponsive polymeric nanoparticles loaded with curcumin50), yeast cell-encapsulated-curcumin with high stability against heat, light and humidity etc. are being developed51) to enhance the bioavailability of curcumin combined with multifunctional attributes. It is pertinent to note that the above mentioned products based on curcumin are treated as herbal/dietary supplements only52) and are regulated by the US Food and Drug Administration (FDA), but not as pharmaceutical drugs. They fall under a category called dietary supplements. Manufacturers must follow good manufacturing practices (GMPs) to ensure that supplements are processed consistently and meet quality standards. Once a dietary supplement is on the market, the FDA is responsible for monitoring its safety. It is interesting to note that Johnson & Johnson has been marketing turmeric band-aids in India53), which are being used as a traditional cure for cuts. It would be worthwhile to consider use of curcumin nanoparticles in place of turmeric for band-aids/dressings for cuts, wounds and other infections as they exhibit enhanced antibacterial/anti-infection properties. Curcumin has only recently captured the attention of the scientific community as providing potential health benefits on account of its antitumor, antioxidant, antiarthritic, antiamyloid, anti-ischemic, and anti-inflammatory properties. One of the greatest challenges in developing curcumin for clinical efficacy is its low oral bioavailability. Curcumin's poor bioavailability within the body can be attributed to its poor absorption and high rate of metabolism in the intenstines and rapid elimination from the body. This has been a major obstacle in preventing its progress from the lab to clinic; therefore, not much progress could be made in conducting clinical trials beyond Phase I. In view of this, curcumin's chemoprevention and therapeutic potential has not been fully exploited for the prevention and treatment of diseases. As has been discussed earlier, nano-enabled drug delivery systems have been developed, which show good promise in overcoming the problem of low bioavailability of curcumin27). In the United States, turmeric (curcumin) is generally recognized as a safe (GRAS) food additive by the FDA. Doctors often prescribe curcumin as a natural, non-toxic remedy that has very few side effects. No serious adverse effects have been reported in humans taking even high doses of curcumin. In a recently conducted Phase I clinical trial54) on 24 adults, it was found that single oral dosages up to 12 g could be well tolerated. 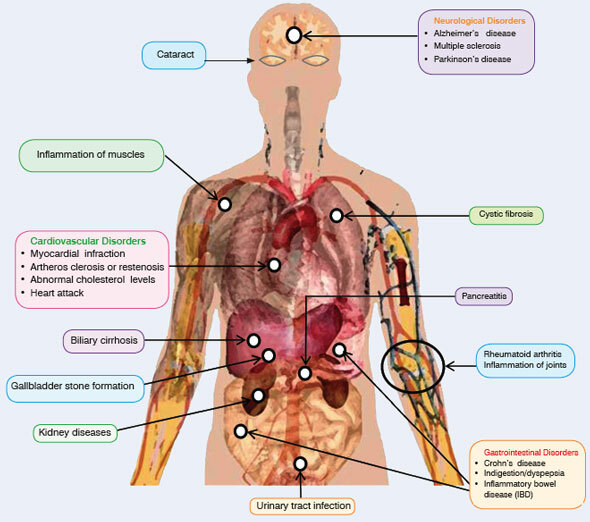 However, contrary to the general perception that curcumin is quite safe there is some evidence suggesting that curcumin may cause toxic effects under specific conditions and these have been discussed in a recent review by Burgos-Mor'on et al55).These include commonly reported side effects like stomach upset, nausea and diarrhea, an allergic skin reaction and anti-thrombosis activity interfering with blood clot formation. There is some evidence suggesting that high dose administration of curcumin in rodents for long-term duration can be tumourigenic. Although side effects have been limited in animal and Phase I short-term clinical studies, long-term, large scale and randomized clinical trials on humans are needed to establish the safety of curcumin at antioxidant and antiinflammatory doses. These clinical studies are also necessary to determine the optimal dosage, bioavailability and bioefficacy of curcumin-based drugs. The major challenge is to develop drugs based on curcumin with scientific evidence acceptable to the global community. An effective drug should exhibit adequate absorption, low toxicity, acceptable distribution, metabolism and excretion, and should be capable of treating the targeted disease with specificity and efficacy. The traditional medicinal system may need to adopt novel strategies such as combinatorial chemistry route combined with nanotechnology to develop curcumin-based drugs having enhanced bioavailability and efficacy. The challenges and technological prospects in realizing nano-curcumin based drugs for the future of medicine and healthcare56) will be covered in a forthcoming issue of this newsletter. In the same issue, global scenario based on literature and patent analysis57) will also be presented. The author would like to thank Ratnesh Kumar of CKMNT for providing valuable inputs on nano-enabled curcumin products. 6) G. Sa and T, Das," Anti cancer effects of Curcumin: Cycle of Life and Death", Cell Div. 2008, 3: 14. Published online 2008 October 3. doi: 10.1186/1747-1028-3-14. By Yashwant Mahajan, Centre for Knowledge Management of Nanoscience and Technology (CKMNT). The full article with an extensive list of references appears in the July 2011 issue of Nanotech Insights. For more information, interested readers may please contact Yashwant Mahajan at [email protected] or mahajan[email protected] and obtain a copy of the full-text article in pdf format.